Dr. Rick Simon is a native of Philadelphia. He did his undergraduate work at Muhlenberg College in Allentown. He received his Doctor of Podiatric Medicine in Philadelphia in 1983. He also has an MBA from DeSales University. Dr. Simon is Board Certified in Orthopedics and Primary Care Podiatric Medicine. 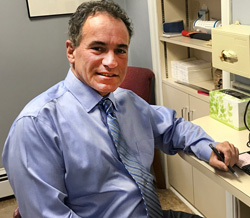 He has been in private practice in Lansdale over 25 years. He is a people person and loves to engage with his patients and make them feel at home. His free time is spent taking classes, working out, cycling and spending quality time at home with family and friends.